I'm having the same issue. Can't accept quests when mouse clicking all the way through. Hey, don't get me wrong, I love the addon regardless. I've been using it since early Legion and I'm certainly not gonna stop now. Was just dropping a note here in case it hadn't been reported/was a known issue. Sorry if I came across as rude or imposing upon you to fix this ASAP, definitely did not mean it that way. No, it's just frustrating when you release a patch where everything appears to be working, only to have to release another patch the very next day. Which I did by the way, your issue should be fixed in 1.0.8. Yeah, understandable frustration honestly. Thank you for the fix! I'm not sure of this is a bug but I've noticed that if I have my bags (I use adibags if that matters) open when I talk to an NPC I can still click on the items in my bag and my clicks don't go to the dialogue choices like they should, the same thing happens when I use vuhdo, I can click on the unit frames when talking to an NPC. I don't know if there is a way to block that or not but it'd be a nice fix if there is. Change Immersion to a higher frame strata. Flip mouse functions = "Flip mouse functions"
Disable horizontal drag = "Disable horizontal drag"
Hide my user interface when interacting with an NPC. = "Hide my user interface when interacting with an NPC." Disable automatic text progress = "Disable automatic text progress"
The regular talking head frame appears in the same place as Immersion when you're not interacting with anything and on top of Immersion if they are visible at the same time. = "The regular talking head frame appears in the same place as Immersion when you're not interacting with anything and on top of Immersion if they are visible at the same time." Global scale = "Global scale"
Disable mouseover highlight = "Disable mouseover highlight"
Hide objective tracker = "Hide objective tracker"
Dynamic offset = "Dynamic offset"
Hook talking head = "Hook talking head"
Left click is used to handle text. = "Left click is used to handle text." Fullscreen dialog = "Fullscreen dialog"
Right click is used to accept/hand in quests. = "Right click is used to accept/hand in quests." Frame strata = "Frame strata"
Stop NPCs from automatically proceeding to the next line of dialogue. = "Stop NPCs from automatically proceeding to the next line of dialogue." On the fly = "On the fly"
The quest/gossip text doesn't vanish when you stop interacting with the NPC or when accepting a new quest. Instead, it vanishes at the end of the text sequence. This allows you to maintain your immersive experience when speed leveling. = "The quest/gossip text doesn't vanish when you stop interacting with the NPC or when accepting a new quest. Instead, it vanishes at the end of the text sequence. This allows you to maintain your immersive experience when speed leveling." Change the placement and scale of your dialogue options. = "Change the placement and scale of your dialogue options." Customize the talking head frame. = "Customize the talking head frame." Disable model animations = "Disable model animations"
Show at mouse location = "Show at mouse location"
Hide interface = "Hide interface"
Hide minimap = "Hide minimap"
Disable portrait border = "Disable portrait border"
Change the speed of text delivery. = "Change the speed of text delivery." How are you doing today? = "How are you doing today?" Disable sheen animation = "Disable sheen animation"
Use your primary mouse button to read through text, accept/turn in quests and select the best available gossip option. = "Use your primary mouse button to read through text, accept/turn in quests and select the best available gossip option." Show text progress bar = "Show text progress bar"
Not sure what's going on with this, but it wasn't there when BfA first launched, it started happening a few weeks ago. I was hoping an update to Immersion would fix, but there hasn't been anything pushed out. Any thoughts? It's a typo that only becomes problematic if the Blizzard talking head UI exists when you first log in, which is usually not the case. Having that said, this will be fixed in the next version. Thanks for your quick reply! Looking forward to the update. I couldn't live without this addon! Just noticed that every time you right click on the quest text UI, the NPC begins their animation again. But figured I would comment on this in hopes the MunkDev would see this! To be honest, there's not a huge emphasis from my side to match animations and make them completely smooth. I think Storyline does a better job at that. It's more or less just intended to be peripheral candy as you focus on reading. After swapping hardware around in my pc, and having to redownload everything, I'm finding that I am no longer able to move the Dialog box by dragging it anymore. I've looked through all tabs of the settings for the addon and haven't found anything related to moving the frame aside from "Show at mouse location". Am I missing something, or was the ability to drag the frame a result of another addon that I may no have remembered to download? It's the very first checkbox in the very first panel you see in the settings. It's really uncanny how many people miss this, and honestly quite interesting from a UX design perspective. How could it be clearer? I'm using Jocycom TextToSpeech for better immersion, but, wjen I use Immersion, the quest texts don't read anymore. I think it is due to the fact that Immersion hide the original Quest window. Is there a way not to hide the original window or to make it work some way with TTS? Depends on which API version they'll use. 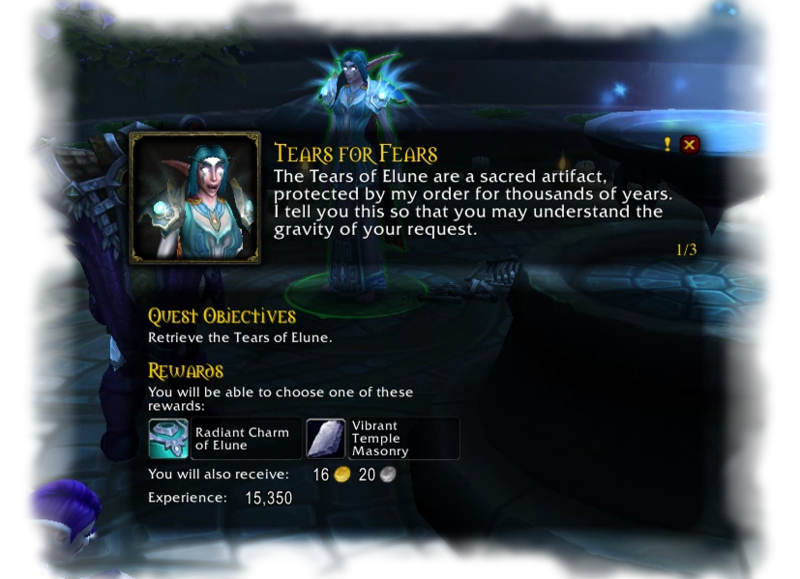 Whenever there is a NPC with 2 or more quests, when you're advancing the quest text with the space bar or the left click with immersion mode, the addon doesn't start the second quest, so you have to click directly on it. It is a minor annoyance but I hope it gets fixed. Noted, thanks for the report. I've found a case where this happens, and should be fixed in the next patch.